Lindsay K. Forsgren is originally from Ellendale, North Dakota, and she currently resides in Pelican Rapids, Minnesota, with her husband, Colby Forsgren. She attended Valley City State University for her undergraduate education, and she attained her law degree at the University of North Dakota School of Law. 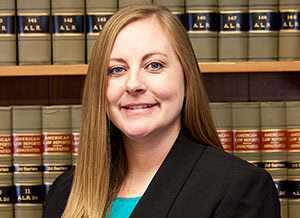 Lindsay started at Krekelberg Law Firm in December of 2017. Prior to joining our firm, Lindsay worked as a law clerk for Paul Hunt in Perham, Minnesota and as an extern at the US Attorney’s office in Fargo, North Dakota. Lindsay moved to Pelican Rapids in December of 2013, commuting to Grand Forks weekly for law school. After graduating from law school in May of 2017, she studied for the MN Bar Exam at her Pelican Rapids home and was admitted to the bar in October of 2017. While attending law school, Lindsay served as the 3L Representative of the Student Bar Association and as the Ex Chequer for Phi Delta Phi, which is a national honor society for law students. For her efforts and involvement at UND, she was awarded the Lillian Elsinga Outstanding Student Leader Award. She is excited to get involved in the community of Pelican Rapids now that she is a full time Pelican Rapids resident. In her free time, Lindsay enjoys spending time with her family. Most family time is spent on or near a lake, or with her parents in North Dakota.